Dixie Electric accepts applications for its Youth Leadership Program in the fall each year. This is a fun-filled, educational opportunity for 11th grade students in Dixie Electric’s service area. Students must be available to participate in all of the assigned dates. Here is a list of dates for 2018 - 2019. This day will consist of speakers, games, lunch and a power plant tour. Out-of-town judges will select two students to go to the Youth Leadership Workshop in Jackson and the Youth Tour of Washington, D.C.
An opportunity to develop leadership skills, experience the political process in action and meet other students from across the state. Amazing tour of the sites of Washington, D.C. and a first-hand look at the political process on the national level. April 26, 2019 in Jones County and May 3, 2019, in Petal; Volunteer at Dixie Electric’s tent and receive community service hours. The deadline for entries is Sept. 7, 2018. If you are interested in participating in the program, you must speak to your high school guidance counselor. If you are a home school student, contact Pollyanna Magee at the Laurel office at (601) 425-2535. The Electric Cooperatives of Mississippi recently held the 32nd Youth Leadership Workshop in downtown Jackson. 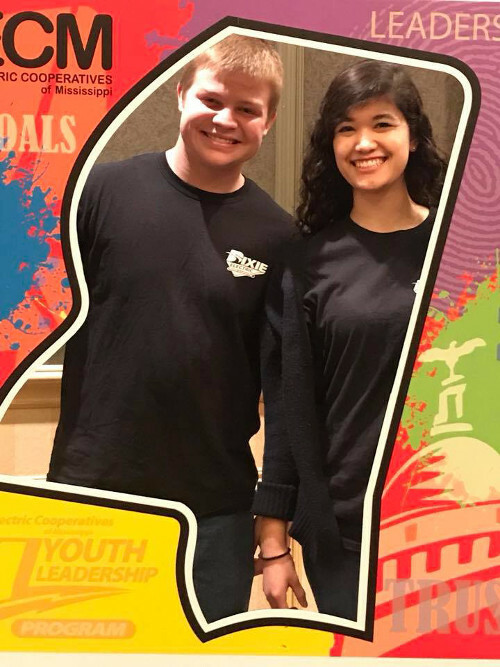 This annual youth event brought students from across Mississippi to the state capital to meet their legislators and to participate in activities designed to enhance their already present leadership abilities. The workshop began on Wednesday, Feb. 21, and continued through Friday, Feb. 23. Electric cooperatives from all areas of Mississippi participate in the program each year. 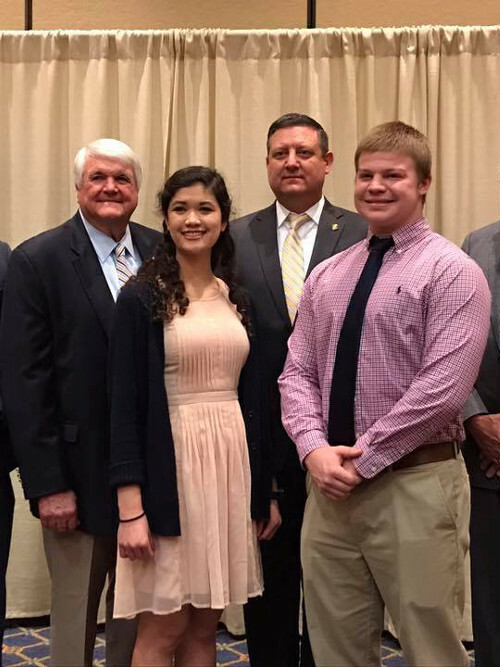 Garrett Crowder and Aubrey Gaudet were selected among the schools in Dixie Electric’s service area to represent the electric cooperative during this hands-on event. This year, 80 students attended the workshop which was held at the Marriott in downtown Jackson. When the students arrived on Wednesday, the workshop began with a “get acquainted” session and they were put into situations where they had to learn about others. They were then asked to participate in a Town Hall meeting, which encouraged them to discuss issues they are facing as young people. Together with their groups, they developed possible solutions to these issues, and were encouraged by group leaders to take the skills they learned back to their schools where they could make a real difference in the lives of their peers. On Thursday morning, the students enjoyed breakfast with senators and representatives who serve in state government on behalf of the districts in which they reside. The breakfast was well-attended with over 40 legislators in attendance. Before visiting the Mississippi State Capitol, Lt. Gov. Tate Reeves spoke to the students and encouraged them to work hard for their dreams. He gave the students three guidelines for success: dream big, make a plan and work hard. “If you do these three things, you can accomplish anything you set your mind to,” he said. Gov. Phil Bryant continues to support this program by speaking to the students each year during a luncheon at the Old Capitol Inn. During his speech, he encouraged the students to pursue their dreams and hold on to their Mississippi values. He discussed the positive economic factors happening in Mississippi and told them that they don’t have to go far from home to become successful. “There are so many opportunities for you in Mississippi to take on leadership roles here. Whether you go on to college or choose a technical trade, there are many advantages to staying right here at home,” he said.The students also heard from other motivational speakers and participated in a fun evening with local magician, Dorian LaChance where he wowed them with his illusions. When the workshop came to a close, the students had made many new friends and memories that will last a lifetime. Building leaders is fundamental to building a strong community and through this program, Dixie Electric hopes to prepare these young people for a bright future. The pro gram has proven to encourage students to reach their goals year after year, and the students take away lifelong relationships. In June, Garrett and Aubrey will travel with the youth group to Washington, D.C. The seven day trip will include visits to all of the popular monuments and memorials, as well as meetings with Mississippi’s congressional delegation during a visit to Capitol Hill.